The first thing that you have to understand is that the words pastor and preacher are not interchangeable. They don’t mean the same thing. This may be a difficult concept to grasp at first because modern society has been using these two words interchangeably for some time now. However, they are very different words with different etymologies. Noah Porter, ed., Webster’s 1913 Unabridged English Dictionary, (Springfield, Mass. : G. C. Merriam Co., 1913), WORDsearch CROSS e-book, Under: “Shepherd”. Sheep + herd. Fairly simple and straight forward – Shepherd. A shepherd is someone that cares for sheep. He makes sure they have food and water. He watches over them. He protects them from being ravaged by wolves. He leads them to greener pastures. The word pastor is informed and derived from the olde English word shepherd. The word shepherd is informed and derived from the Hebrew word ‏רָעָה‎ rāʿāh. Phonetically, raw-aw’. The first and most common meaning is “to pasture,” “to tend,” “to graze.” This primary root occurs over 150 times. Many versions, including the KJV, often render it as “to feed,” but the meaning actually goes beyond feeding to include all the responsibilities of caring for animals. In the text, those that feed and care for the people are often referred to as shepherds. In the text, shepherd does NOT mean godly. Pagan kings were also called shepherds of their people. King Cyrus the polytheistic king (worshiped more than one god) was called shepherd. Yes, King Cyrus was be called a pastor in the text. he will do everything I want. The shepherds (pastors) are destroying and scattering the sheep in my pasture!” says Adonai. driven them away and not taken care of them. So I will ‘take care of’ you because of your evil deeds,” says Adonai. and they will be fruitful and increase their numbers. and none will be missing,” says Adonai. when I will raise a righteous Branch for David. will be Adonai Tzidkenu [Adonai our righteousness]. 11 “I am the good shepherd (pastor). The good shepherd (pastor) lays down his life for the sheep. Yeshua (Jesus) was the model of the good shepherd – the good pastor. So then, maybe you are asking, “What is a preacher, if pastor and preacher are not the same thing? Preacher means to cry out – one who makes something publicly known. He is a proclaimer. Preacher does NOT mean godly. Town Criers were preachers. Greek orators were preachers. Senators and Congressmen were and are preachers. The president of the United States is a preacher. They cry out. They make things publically known. They proclaim. “Clear a road through the desert for Adonai! ‘In the desert prepare the way of Adonai! As you can see from the text, Yeshua was both a pastor AND a preacher. Yes, He was both! So why the title of this piece? TOO MANY PASTORS . 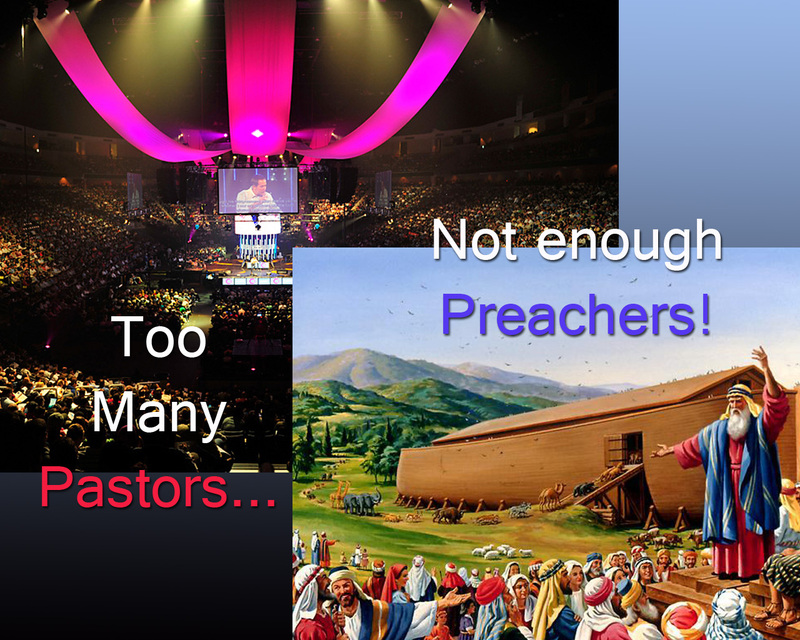 . . not enough Preachers! To understand this, we must first look at the following verse in the text about Noach. Noach, and the 7 members of his family that he shepherded (pastored), weren’t preserved because he was a shepherd of that family. Noach was preserved because he was one that “cried out – “preached,” and “cried out/preached” about something specific . . . righteousness! with seven others, and brought the Flood upon a world of ungodly people. Noach was a preacher of RIGHTEOUSNESS . . .
Yeshua was a preacher of RIGHTEOUSNESS! 3 No, I tell you. Rather, unless you turn to God from your sins, you will all die as they did! Yeshua is saying something simple . . . So who defines sins, God or the church? I ask this simple question so that we can be clear here – so that there are no misunderstandings . . .
We have a ton of pastors in this world. Some do a very good job of protecting their flocks from unrighteousness that comes from cultural acceptance of societal norms. Societal norms are the human standard – the worldly standard, NOT the Holy standard! It is the pastors, more than anyone else that influence the flocks. From their pulpits on any given Saturday or Sunday, you will hear them more often that not, talk about their favorite secular movies, their favorite secular songs, their favorite secular sports heroes . . . It is the shepherds that inculcate to their flocks that worldly is just a matter on conscience . . . It is the shepherds that are teaching their flocks that unrighteous is permissible . . . It is the shepherds that are teaching their flocks the Pharisees are hypocrites, not them . . .
And while guys like pastor advocate Thom Ranier address many of the problems that pastors face in the church today in his blog, most of the time, his posts are only addressing the symptoms and not the root cause . . . The shepherds have become luke warm . . . It is almost embarrassing reading some of the responses he gets from pastor’s in his blog whining about what a tough job being a pastor is . . . While it is tough, it is not a job – it is a calling. Not many pastors on his blog complaining about mary-jo-pulpit-goer would like the life of being a talmidim (disciple) in the time of Yeshua . . . disciples that died gruesome deaths. True enough, they didn’t have to worry that the music they played might cause people to send them a fiery email threatening to leave . . . TURN FROM YOUR SINS TO GOD! MAKE STRAIGHT PATHS FOR ADONAI! I say this to their shame because Yeshua is very clear . . .
UN-righteousness will lead you straight to to hell . . .
You see, being a pastor, does not necessarily make you a preacher of righteousness. If it did, there would be no such thing as a homosexual that is ordained. However, if you are a preacher of righteousness first – like Noach, then you are are also a pastor (shepherd) to those that you would protect and guard because you making God’s definition of righteousness the BASIS for what you do. A preacher of righteousness does NOT copy a Christian album they have and share it with another without them paying for it . . . Yes the Lord is our shepherd – our pastor . . .
With the Lord for a shepherd, what we need is a lot less shepherds and a lot more preachers . . .
A lot more people Crying Out what the the Lord says is good and bad . . .
Men like Noach that proclaim righteousness . . . . It was PREACHER, not a pastor, that the Lord found favor with and decided to spare the world. Ewww, he so preachy . . .
You’re preaching to the choir . . .
Don’t preach at me . . . . The following is pastoring because it is PREACHING first . . . .
“Where is this promised ‘coming’ of his? the world of that time was flooded with water and destroyed. when ungodly people will be destroyed. This entry was posted in Living life Even if . . .. Bookmark the permalink.